They say, “to plant a garden is to believe in tomorrow.” I find this quote to be absolutely true, especially when it comes to planting bulbs in the Autumn for the next year’s spring blooms. With Autumn here, it is time to start planning ahead and planting bulbs for next spring and summer. I personally love planting bulbs, the ease of putting them in the ground and forgetting about them until they rise up and let you know spring is coming. They are such a beautiful reminder of new beginnings. For the best bulbs to plant in the fall and a how to guide on properly planting them, read on! Planting bulbs is quite easy. Follow the simple steps below for fool-proof bulb planting! Figuring out the right time to plant your bulbs is important. Typically, in the months of September and October, bulbs can be safely planted, as the ground is cool enough to not damage the bulb. If you are in a cold climate, take note that bulbs do need to be planted about 6-8 weeks before the ground freezes. In hotter climates, it might be wise to pre-chill your bulbs to ensure blooming. To pre-chill, just refrigerate the bulbs until the ground cools down. In selecting a spot to plant the bulbs, the only real consideration is to find a spot that drains well. Bulbs can easily mold if they sit in stagnant water for too long. They thrive in well-drained soil and sunshine. Dig a hole in the soil about 3-4 times the height of the bulb. Bulbs should be planted about 12-14 inches apart from each other. Add fertilizer with higher phosphorous and nitrogen for root development and vegetative growth. A tip for digging multiple holes at one time is to purchase a handheld bulb auger. Purchase options here! Plant the bulb with the roots down and the nose up. The nose simply means the top of the bulb, referring to the part where the leaves and flowers sprout. Cover with dirt and mark the location to avoid planting other plants too close together. This also helps if you are planting a specific color pattern, knowing which tulips for example are pink versus yellow. Typically, bulbs receive enough water during the autumn and winter to grow in the spring. 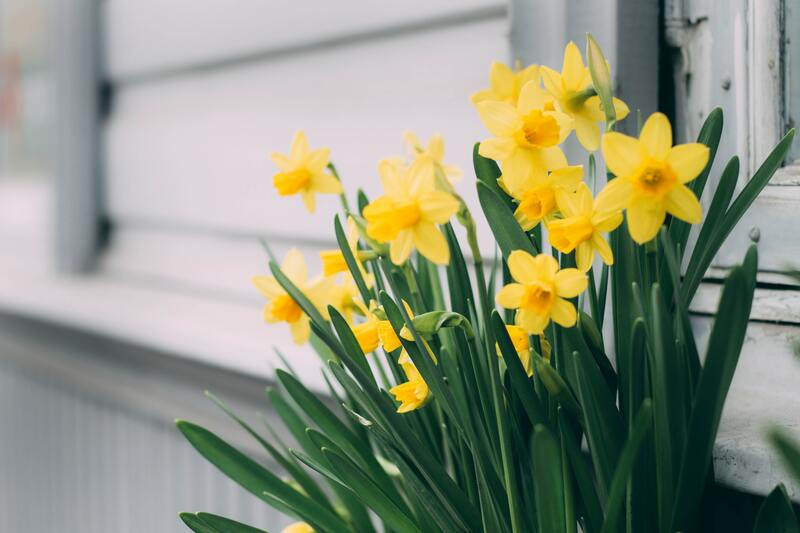 However, if you are in a drought zone, as most of us in California have been, make sure you water your bulbs frequently enough to promote growth, but do not over water! When the first shoots of your bulbs start poking through the soil, you know spring is on the horizon. Time to enjoy the beauty of your spring garden!